Organisms of Earth occupy a wide range of temperatures with extremophiles being found at temperatures greater than 100 οC and below 0 οC. These environmental factors have exerted a selective pressure on extremophiles, evolving proteins that can function properly in such demanding environments. 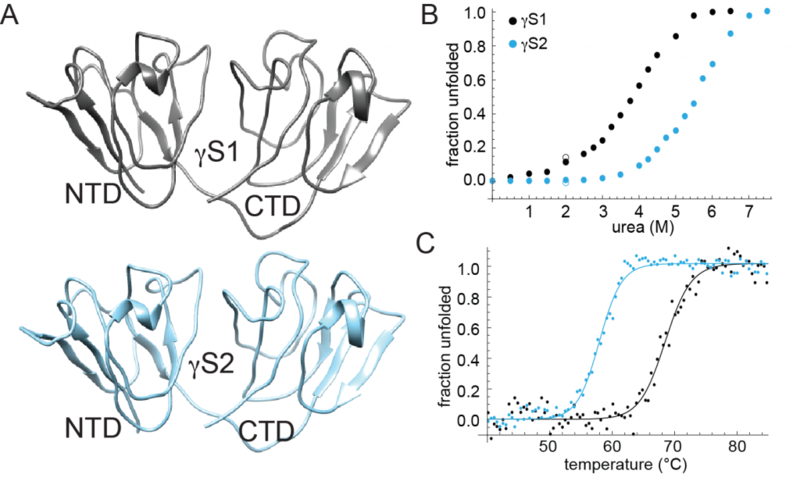 By comparing the proteins of organisms from a diverse range of thermal environments, basic principles about protein stability at a given temperature can be uncovered. (A) Homology models of γS1 and γS2 from Antarctic toothfish (based on the structure of human γS-crystallin). (B) Unfolding of γS1- and γS2-crystallin in urea, measured using CD spectroscopy. (C) CD-detected thermal denaturation profile of γS1- and γS2-crystallin. Surprisingly, although γS1 has the higher thermal stability of the two, it is more susceptible to chemical denaturation. Crystallins are small proteins in the eye lenses of animals with the primary function of refracting light. These proteins are unique in that they have been selected for extremely high solubility and high stability over time, with crystallin concentrations exceeding 1000 mg/mL in some aquatic species. No significant protein turnover in the eye lens, means that crystallins must be able to last the life time of the organism without degrading or forming aggregates, which results in cataract formation. One way cataract formation occurs is through extreme temperature exposure. This exposure can lead to temperature-dependent denaturation and subsequent aggregation of the crystallins, or to temperature-dependent phase separation. However some organisms live at temperatures beyond which temperature-dependent aggregation would occur in related organisms. One such organism is the Antarctic Toothfish (Dissostichus mawsoni), which lives in the Southern Ocean and has an average body temperature of -2 οC. D. mawsoni contains two γS-crystallins that share high sequence conservation with each other and with other vertebrate γS-crystallins. These crystallins serve as a great model system to compare to mesophilic γS-crystallins and discover features conferring enhanced cold stability and solubility. By using NMR techniques the toothfish γS-crystallins can be solved and used as another way to compare to the other mesophilic γS-crystallins.